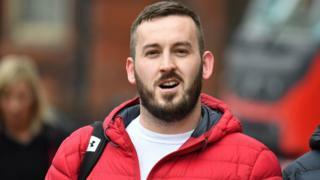 James Goddard, 29, from Altrincham, Greater Manchester, is alleged to have called the MP a "Nazi" and a "traitor". He denied three charges before the case at Westminster Magistrates' Court was temporarily adjourned when people in the public gallery started shouting. First appearances in court are usually pretty straightforward affairs - the accused speaks only to confirm his or her name, age and address, and it's all wrapped up in the space of just a few minutes. From the start though, this case was something different, with proceedings at times descending into chaos. James Goddard refused to give his address, saying he didn't want to reveal it in front of the 'vultures' inside court - as he gestured towards the gathered media. Around 50 of his supporters were packed into the public gallery. They applauded him on several occasions, then started chanting 'Shame on you' at the court officials. One shouted at the judge: "He's not a terrorist, you know." Calls for calm fell on deaf ears. Eventually the judge hastily left the courtroom. When the case finally resumed, the chaos continued, with Mr Goddard stepping out of the dock to complain that he would not get a fair trial. Addressing the court, he said: "It's not illegal to heckle an MP. All of this is wrong." About 15 minutes into the hearing, the proceedings were adjourned after people in the public gallery started shouting that Mr Goddard should sack his lawyer and also chanted "Soubry is a Nazi". The courts service said it was "deeply concerned to hear of intimidating behaviour" at the hearing. A spokesperson added: "We apologise to all those affected and are urgently investigating what happened. This sort of behaviour will not be tolerated."